Join the 9th Annual Survive and Thrive, along with California Youth Services and Positive Matters for the 5K walk/run to be held Saturday, October 6th, 2012. The event will be held at the Orange County Sheriff Training Academy, 15991 Armstrong Avenue, Tustin, California, 92782. It will be fun rolling, limping, walking and running as well as helping with non-profit business booths. The Health and Safety Expo will be held 7:00am to -12:00pm. Please come check it out.. To register online, please go to: www.SurviveAndThriveRunWalk.org. Join the 9th Annual Survive and Thrive, along with California Youth Services and Positive Matters for the 5K walk/run this Saturday, October 6th, 2012. The event will be held at the Orange County Sheriff Training Academy, 15991 Armstrong Avenue, Tustin, California, 92782. It will be fun rolling, limping, walking and running as well as helping with non-profit business booths. The Health and Safety Expo will be held 7:00am to -12:00pm. Please come check it out.. To register online, please go to: www.SurviveAndThriveRunWalk.org. Matthew Thomas completed the 5K event of the Seal Beach 38th Annual Run in a time of 52 minutes, 16 seconds. Matt silenced the sceptics by achieving a time competitive with those who are unimpaired. Once again, Matt has proven an example to others who are disabled and that with the right training and positive outlook they too can put their "ability" into "disability". Long Beach, CA - Sunday, Sept. 11th - WORLD RECORD ATTEMPT! We all hear stories about people who have overcome great obstacles and come out on top to help others. This is one of them! In the early 90s, Matt Thomas of Newport Beach, California was in a car with his friend who was driving under the influence of alcohol. It did not end well for Matt. 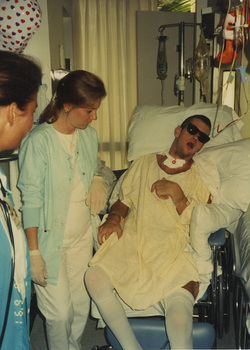 The two experienced a terrible car accident and Matt obtained serious brain damage leaving him permanently disabled and partially paralyzed on his entire left side. 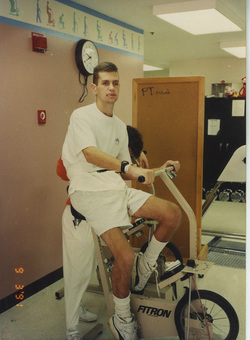 Matt had a long road ahead of him, working to rehabilitate his mind and body. A couple of years into his rehabilitation process, Matt was given a Hydrobike by his friend, Jim Roue. Then Jim Roue moved and gave Matt two hydrobikes to maintain and ride. For 17 years, Matt would ride short distances for fun. Over that time, the use and maintenance of the hydrobikes served to facilitate the healing of both hemispheres of the brain, including the areas affecting memory, balance, multitasking, attention, concentration, organization, insight, stamina, endurance. All of which resulted in greater independence, happiness and enjoyment of God's habitat - the ocean and water. Matt expanded his work regime of riding and maintaining hydrobikes facilitating the rehabilitation of his motor skills yielding improved memory and coordination. When he started out, he was not able to fully ride a hydrobike or clean a hydrobike by himself. Now he is training for a 28 mile ride from Catalina. California and a group of prominent long Cyclists are sponsoring the 26-mile Hydrobike Ride from Catalina to Long Beach to be accomplished by Matt. The ride is scheduled for Sunday, September 11th as a fund raiser publicizing "Responsible Alcohol Drinking and Serving". It is amazing to think how far Matt has come in such a short time. We will be following Matt’s 26 mile hydrobike ride. To show your support for Matt, log onto our Hydrobike Facebook fan page and post your words of support, encouragement, and cheer him on for his big event. 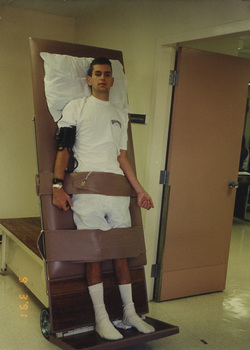 1991 - Northridge, CA - Matt standing on tilt-board.